Background to the word of knowledge in John 4. “Therefore when the Lord knew that the Pharisees had heard that Jesus was making and baptizing more disciples than John (although Jesus Himself was not baptizing, but His disciples were,) He left Judea and went away again into Galilee. And He had to pass through Samaria. " Jesus had been ministering in Jerusalem and Judea and was on his way to back to Galilee – Jews would normally go around Samaria – The Samaritans were a people who some say were descended from Joseph. They had remained in the land after the Assyrians had taken most of the Jews into exile. When the Jews returned they rebuilt the temple in Jerusalem. There was a falling out between the Samaritans and those who returned so the Samaritans built their own temple on Mt Gerizim. After this the Jewish people shunned them, and most Jews especially the religious ones now avoided them. Jesus chose to go straight into Samaria, I believe something drew Jesus to go through there and he was on a mission– maybe a vision or guidance of the Holy Spirit scripture does not say. “He came to a city of Samaria called Sychar" (4965) which comes from the Hebrew shekar 7942 which means intoxicating drink, strong liquor. This may have been a significant influence on the people and a principality over the area? He sat and rested at Jacob’s well which was half a mile outside Sychar in the countryside and sent His Disciples in to buy food. Jesus was probably thirsty as it was midday and the well which still exists has been measured at 138 ft deep. There was probably a rope but no vessel to lower down to draw water with, as people would normally bring their own. 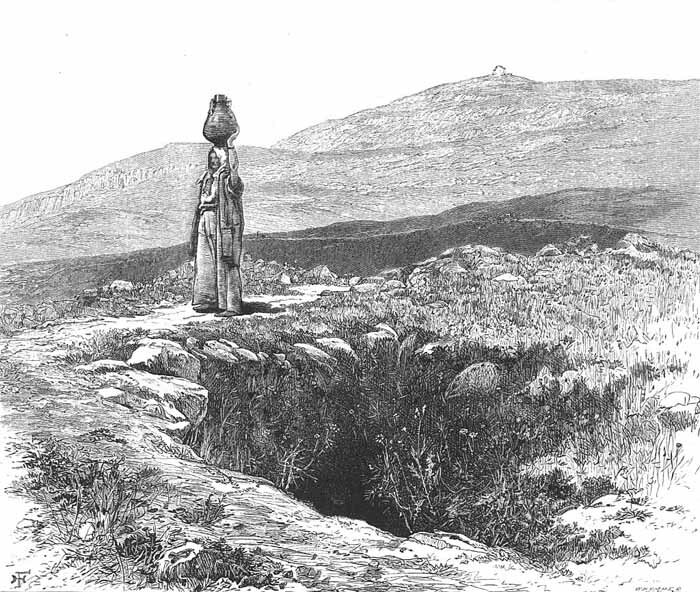 As he sat and rested he may have thought about Jacob whom the well was named after. He may have thought about his mother Rebecca and the story of how she was met by Abraham’s servant while she was drawing water. "He made the camels kneel down outside the city by the well of water at evening time, the time when women go out to draw water. He said, "O LORD, the God of my master Abraham, please grant me success today, and show lovingkindness to my master Abraham. "Behold, I am standing by the spring, and the daughters of the men of the city are coming out to draw water; now may it be that the girl to whom I say, 'Please let down your jar so that I may drink,' and who answers, 'Drink, and I will water your camels also'--may she be the one whom You have appointed for Your servant Isaac; and by this I will know that You have shown lovingkindness to my master." Before he had finished speaking, behold, Rebekah who was born to Bethuel the son of Milcah, the wife of Abraham's brother Nahor, came out with her jar on her shoulder. The girl was very beautiful, a virgin, and no man had had relations with her; and she went down to the spring and filled her jar and came up. Then the servant ran to meet her, and said, "Please let me drink a little water from your jar." She said, "Drink, my lord"; and she quickly lowered her jar to her hand, and gave him a drink. Now when she had finished giving him a drink, she said, "I will draw also for your camels until they have finished drinking." So she quickly emptied her jar into the trough, and ran back to the well to draw, and she drew for all his camels."